When anybody talks about salt lamps, the first thing that we assume about them is that they must be Himalayan Salt Lamps. The reason is that they are the most used and widely accepted lamps. Himalayan salt used has a number of benefits and properties especially the ‘negative ion generation”. The Himalayan salt lamps have gained a lot of hype due to its health benefits. Wooden basket Himalayan salt lamps. Wired basket Himalayan salt lamps. Wooden Basket Salt Lamp is a very unique kind of Himalayan Salt Lamps. It is a wooden basket made up of high-quality wood material. Its wood is extracted from Neelum or Sheeshum. The salt chunks are then put inside the wooden basket. The whole presentation looks like coal is burning inside the wood. It is present in various shapes and sizes. The base accumulates all the Himalayan Salt chunks. If such Wooden Basket Salt Lamps are placed in an office or in the room, it will soothe the whole environment. Such lamps are very beautiful and fascinating to use as home décor. 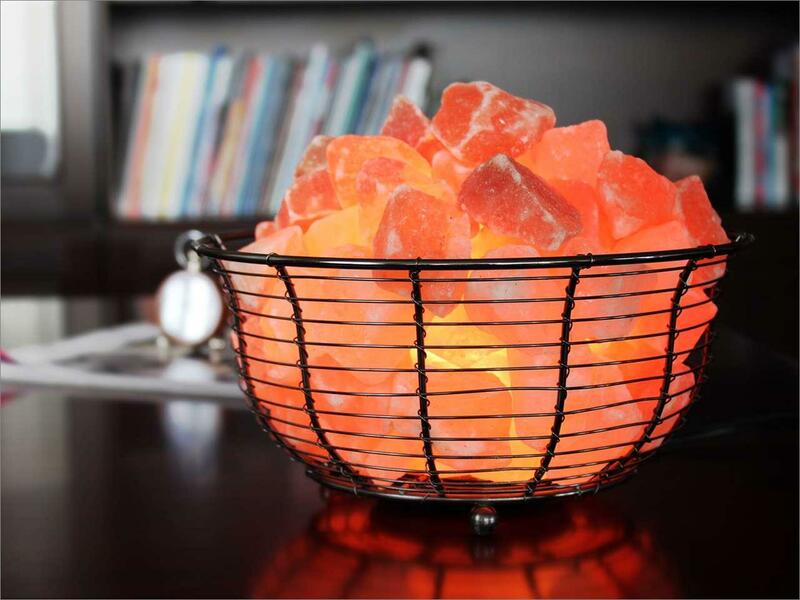 Another modified form of Himalayan salt lamps is the metal basket salt lamps. It is basically a basket of metal in which different pieces of salt are kept with a bulb in the center. The reason for modifying Himalayan salt into the basket is to have a large number of salt blocks in less area. This means more production of good ions in less area consumption. The metal baskets are present in different shapes and styles of frames. The frames could be designed as stars, wires or mesh baskets. Last but not least, Wired Basket Himalayan Salt lamps are the other kinds of lamps. It is a wired structure with salt crystals of Himalayan salt inside. It serves the purpose of lamp and beautification in décor. They have a larger surface area which means that more negative ions will be produced in the room. Small bulbs will be used in the small baskets, which directly means less consumption of electricity. More salt chunks will have more ability to capture the pollutants and heat up the salt to neutralize positive ions of the atmosphere. The people surrounding the Basket salt Lamps will experience a soothing aura. The baskets are easy to maintain. They form the best decoration pieces. Himalayan Basket Salt Lamps increases the beauty of the room. There are never-ending good features of basket salt lamps found in the market. The above-mentioned are just a few of them. Go to any Himalayan salt manufacturers in Pakistan and choose your piece of art.